The Endangered Species Act (ESA) has been described as the most comprehensive legislation for the preservation of endangered species ever enacted by any nation. It is also one of the United States' most controversial natural resource laws. More than thirty clam species were federally listed as endangered as of November 2002. 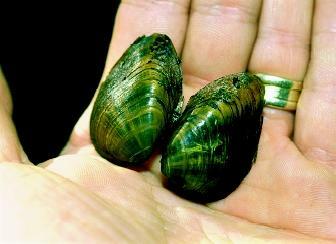 Fresh-water mussels, such as this clubshell mussel, are particularly at risk. listed as either threatened or endangered, in addition to nearly 560 foreign species. Two federal agencies administer the Endangered Species Act. The U.S. Fish and Wildlife Service (FWS) is responsible for terrestrial and freshwater species. The U.S. National Marine Fisheries Service (NMFS) coordinates Endangered Species Act activities for marine and anadromous species. The Endangered Species Act requires the FWS and NMFS to list endangered or threatened species. A species is endangered if it is in danger of extinction in all or a significant portion of its range. A threatened species is one that is likely to become endangered in the foreseeable future. Endangered species receive greater protection than threatened species. Listings are based solely on the biological status of the species and threats to its existence. Economic considerations are irrelevant in these scientifically based assessments. The FWS and the NMFS must generally designate a species' critical habitat when an agency lists the species. Critical habitats are areas that require special protection because they contain the physical and biological features essential to the species' existence. The FWS and NMFS must consider the economic impact of critical habitat designations. After listing a species, the FWS and NMFS must then develop and implement recovery plans for each listed species, unless a recovery plan will not promote the species' conservation. Recovery plans describe the actions necessary to increase a species' numbers and eventually allow for the "delisting" of the species. 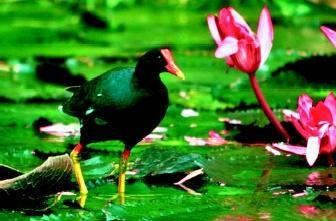 The Hawaiian common gallinule was among the first species to be listed under the Endangered Species Preservation Act of 1966. This legislation was a forerunner of the 1973 Endangered Species Act. action will jeopardize a species, they issue what is called a "biological opinion," offering reasonable alternatives about how to modify the proposed action. If the action cannot be modified to protect the species or its habitat, the agency cannot undertake it. Private citizens and state and local government, as well as the federal government, cannot "take" an individual member of a listed species. The Endangered Species Act defines "take" as "to harass, harm, pursue, hunt, shoot, wound, kill, trap, capture, or collect" a species. The FWS defines "harm" as significant habitat modification. Amendments to the Endangered Species Act authorize the FWS and NMFS to issue "incidental take permits" to take individual members of listed species if the taking occurs while conducting a lawful activity. Permits are issued if the applicant prepares a habitat conservation plan that discusses the impact of "taking," specifies steps to minimize and mitigate the impact on the species, and explains why alternatives are not feasible. Fresh-water and marine fish, mollusks, crustaceans, amphibians, reptiles, birds, and mammals are among the animals protected by the Endangered Species Act. Aquatic animals include categories such as seals, sea lions, whales, ducks, fish, alligators, crocodiles, turtles, frogs, salamanders, lobsters, clams, and snails. Fresh-water and marine plants also are protected, ranging from lichens to seagrass. Tellico Dam and the Snail Darter. One of the earliest and most well-known applications of the 1973 Endangered Species Act involved an aquatic species. When the Tennessee Valley Authority (TVA) was nearing the completion of its Tellico Dam in 1973, scientists discovered a previously unknown species, the snail darter ( Percina tanasi ). The dam's completion would have eradicated the only known population of the species. Environmentalists sued and the U.S. Supreme Court was forced to decide whether the ESA's protections for a 2-inch minnow could prevent the completion of a $150-million dam. In a landmark case ( TVA v. Hill ), the court ruled that Congress enacted the Endangered Species Act to "halt and reverse the trend towards species extinction, whatever the cost," and prohibited the dam's completion. Congress later exempted the dam from the act and the dam was completed, but by then, snail darter populations had been discovered in other locations. As of 2002, the snail darter remained federally listed as a threatened species. SEE ALSO Amphibian Population Declines ; Bivalves ; Crustaceans ; Ecology, Fresh-Water ; Ecology, Marine ; Fish ; Fish and Wildlife Issues ; Fishes, Cartilaginous ; Instream Water Issues ; Legislation, Federal Water ; Marine Mammals ; Reptiles ; Salmon Decline and Recovery . Stanford Environmental Law Society. The Endangered Species Act. Stanford, CA: Stanford University Press, 2001. Sullins, Tony A. The Endangered Species Act. Chicago: American Bar Association, 2001. Tennessee Valley Authority v. Hill et al. 437 U.S. 153 (1978), Certiorari to the UnitedStates Court of Appeals for the Sixth Circuit, No. 76-1701, Argued April 18, 1978, Decided June 15, 1978. Endangered Species. NOAA Fisheries, National Marine Fisheries Service. <http://www.nmfs.noaa.gov/endangered.htm> . The Endangered Species Program. U.S. Fish and Wildlife Service. <http://endangered.fws.gov/> .